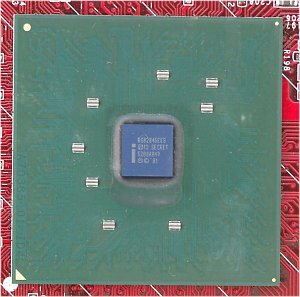 The transition of the Pentium 4 processors onto the 533 MHz bus was discussed last time. But we described just one "hot" chipset, while the others were announced and appeared on the shelves half a year ago. 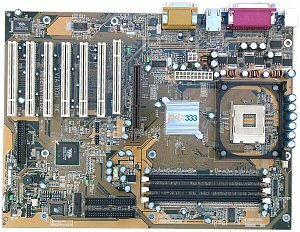 Today we have more interesting products; note that Intel is only now announcing its DDR chipsets, while the VIA's product was presented a long time ago, but real boards haven't arrived yet (we tested the reference sample). First of all let me explain why there are two chipsets. Well, it is simple: the i845E is a classic version, the i845G is an integrated one. 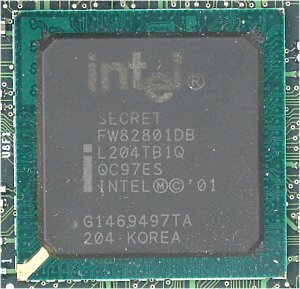 But the i845G is also classic, it is a classic integrated chipset (i.e. in accordance with the UMA (Unified Memory Architecture) a video adapter directly accesses a memory in parallel with the processor, which reduces the overall system performance - contrary to the NVIDIA nForce-420 chipset with the TwinBank architecture). The integrated video adapter needs memory, and the system allocates a frame buffer up to 8 MBytes from the RAM (in the current firmware version). 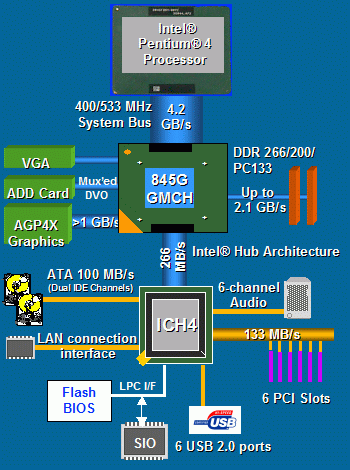 The north bridge called Intel MCH (Memory Controller Hub), or GMCH in case of the integrated graphics core of the i845G, extends the line of the i845 controllers and remains compatible in outputs. The updated version has a 533 MHz processor bus support; besides, in the i845E only the DDR200/266 memory is supported, while the i845G can work also with the PC133 (undoubtedly, this is just market partitioning: PC133, according to them, can be useful in the office PC sector, which the i845G is meant for). I don't want to keep on repeating that the Pentium 4 with the SDR SDRAM is quite a bad combination; I just doubt that boards on the modern chipset with connectors for the SDR SDRAM can appear. It's interesting that lack of the DDR333 support is also a marketing trick, and it is so obvious (in the beginning of the second half-year Intel is going to release two more chipsets which will differ from the current pair only in the DDR333 support) that the Intel's board we have allows setting the memory frequency at 166 MHz (DDR333). Surprisingly, the MSI's board on the i845E which is very rich in functions doesn't allow this. The ICH (I/O Controller Hub) - ICH4 version - was long awaited. The most important thing that is added in the new ICH version is support of 6 USB 2.0 ports with the extended host controller interface (EHCI). As you remember, the USB 2.0 is an evolutionary extension of the USB 1.1 bus which has a 40 times greater throughput (up to 480 Mbit/s) and is fully compatible with the USB 1.1. Besides, the sound is also improved - a 20-bit audio controller interface, support of up to 3 codecs (to make the transition to the 6-channel sound simpler) and operation with Dual DMA units to provide support for simultaneous output via PCM and S/PDIF. Of course, 6 PCI devices, 2 IDE controller for 4 ATA100 devices and a LAN interface are also here. Well, everything looks excellent, but let's wait for the tests. VIA used to put off its best ideas - it released new chipsets which differed from the old ones only in the faster memory controllers... But this time they managed to pour out everything they got. It supports Pentium 4 (and Celeron on the Willamette-128) with a 400/533 MHz bus. 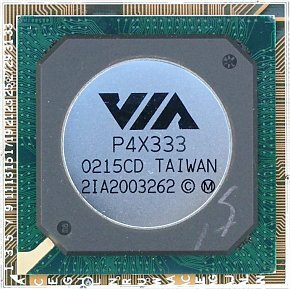 It's interesting that VIA states that the P4X333 is their first chipset supporting Intel processors on the 533 MHz bus. But we do remember P4X266A and its recent tests with the Pentium 4 on the 533 MHz bus. Besides, the DDR333 support is not new either. The P4X266A worked with the DDR333 excellently, but this wasn't specified in the documentation. Moreover, the maximum memory supported on the P4X333 is 32 GBytes! Just compare with 4 GBytes of its predecessor and 2 GBytes of the i845x. It's clear that such volume is not achievable now (there are no such modules on the market, the maximum which is available is 512 MBytes (without ECC)), but the phrase sounds really impressive. And the last, but not least is AGP8x mode support (complying with the AGP 3.0 specification). I think that there is no need to discuss this mode now when nobody has seen yet video cards supporting this mode. That is why let's just describe it briefly. The new specification is aimed at acceleration of the data exchange between the video card's memory and RAM. It accelerates twice at the expanse of the increased exchange rate: the AGP port's frequency is the same (66 MHz), but now data are transferred 4 times faster (QDR, like on the Pentium4's data bus). However, the AGP 3.0 has one weak link - the AGP connector can't keep its universality because of the reduced supply voltage: the AGP8x will be back compatible with the AGP4x, but not lower. That is why if you are going to get an old video card AGP2x by the time of upgrading your system, the P4X333 won't suit you. 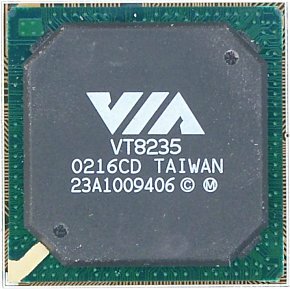 The chipset uses the VIA VT8235 south bridge. Let's dwell on its peculiarities. The first thing we have here is an integrated USB 2.0 controller. Above we have shown differences between the old version (USB 1.1) and the new one (Hi-Speed USB 2.0); the VT8235, like the ICH4, supports up to 6 USB 2.0 devices. The second innovation is ATA133. And the VIA's product supports up to 4 devices, and Maxtor FastDrive and BigDrive technologies. Besides, it also supports up to 5 PCI 2.1 Bus Master devices, there is an integrated network controller for 10/100 Mbit Ethernet and an AC'97 codec for 5.1 Surround Sound Audio. As expected, the extended functionality and a potentially greater data stream from the south bridge come along with the extended V-Link bus which links together both bridges. The throughput is twice greater, up to 533 MBytes/s (data are transferred through the 133 MHz bus, QDR), and now, in this respect, VIA goes on a par with SiS (MuTIOL) and outscores the Intel Hub-Link twice. 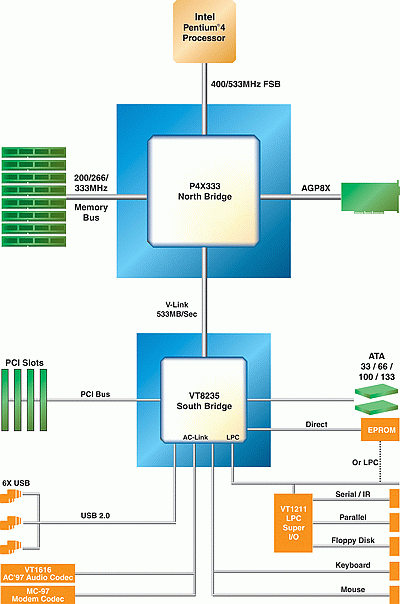 Like all other VIA's bridges, the P4X333 is compatible with its predecessors in layout (P4X266, P4X266A), and the VT8235 with any south bridge of its series (VT8233, VT8233C, VT8233A). This allows board makers to develop products on the new chipsets without much expenses. It makes no sense to describe the reference board VIA VT8116C separately, you can look at its photo and study the data in the table. Note that the board doesn't look pure reference, and I think that after slight changes it will appear on the market under the VPSD trademark. The Intel D845GBV board has successfully passed all the tests, but its results are much worse than those of the Chaintech's product, that is why we don't publish them. Intel boards, as you know, are meant primarily for the OEM market where performance is not very important. Nevertheless, if you are interested in capabilities of the Intel's board, please, refer to the link in the testbed section. Today we will finish estimating the benefit of the Pentium4's transition onto the 533 MHz bus by testing the last pair of i845D-i845E(i845G). Besides, we will check whether the speeds of the i845E and i845G coincide. Finally, there is one more interesting issue connected with the i845G: how much does the performance drop when the integrated graphics is enabled? Note that the Intel's integrated accelerator is far not for games, but we are not going to compare it with the GeForce3 Ti500 - we just want to estimate to what extent the UMA architecture slows down operation of the processor and memory in usual business and home tasks (not in games!). 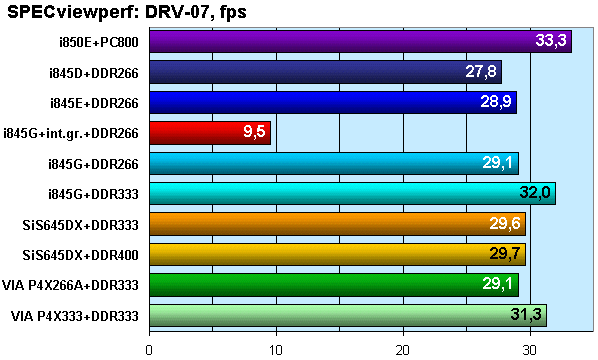 At last, it's interesting to look at the performance level of the new VIA's chipset whose specs look so intriguing. To clarify the general situation connected with the chipsets for Pentium 4 on the 533 MHz bus we included results of the old leaders: i850E+PC800 RDRAM, SiS645DX+DDR333 and +DDR400, as well as VIA P4X266A+DDR333. 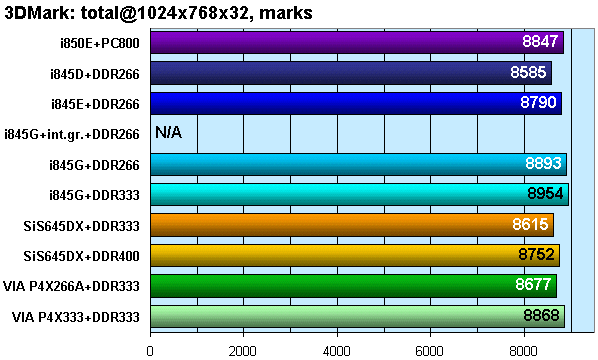 The bars of the chipsets from the same manufacturer are of similar colors (except the i845G version with the integrated graphics). Also remember that the results of the Intel D845GBV are not shown on the diagrams, that is why "i845G" implies the Chaintech 9BIF everywhere. 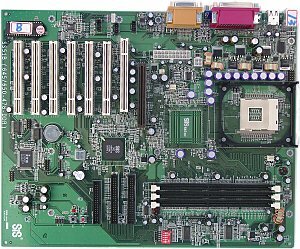 At last, the MSI board doesn't support operation with the DDR333 memory, that is why for the i845E we have results of operation only with the DDR266. We can see again that the speed of the equation solving unit in the CPU RightMark doesn't depend on a chipset, and it just slightly depends on the real CPU frequency on a certain board. Further we are going to use results of this benchmark module only to compare different processors including models with different supported instruction sets. The rendering unit gives us several interesting results. First of all, we get a considerable speedup (over 20%) on the Intel's chipset when jumping from the P4 2.4 GHz to the P4 2.4B GHz. 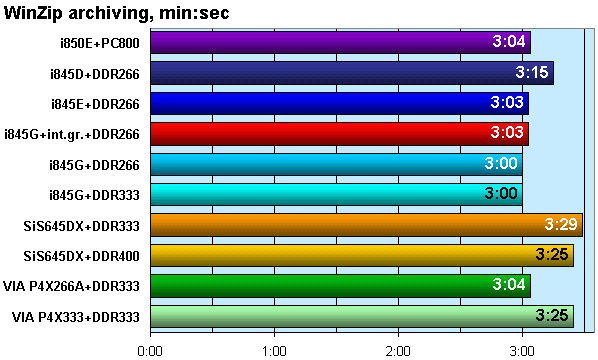 Taking into account the last tests we can state that this test much depends on the processor bus's speed. The low performance boost of the SiS 645DX can be explained by the fact that frequencies of the processor and memory buses do not coincide (100->133 MHz at 166 and 200 MHz on the memory), while the i845 works in the pseudo synchronous mode (133 MHz (x4 è x2) in case of DDR266). 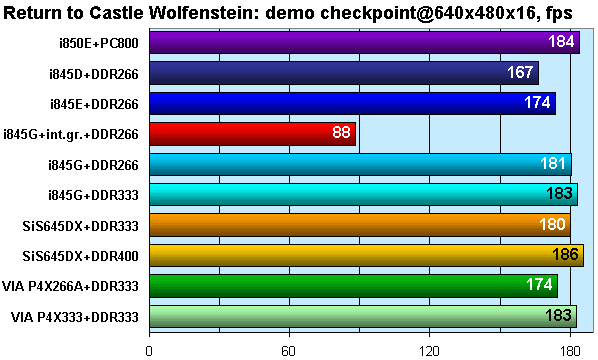 The faster memory (DDR333 on i845G) doesn't help again, and the DDR chipsets from Intel and VIA perform equally. Besides, when the integrated graphics of the i845G is enabled the speed falls down a little. The low-level read/write memory operations reveal the first trouble related with the integrated graphics of the i845G - the speed of operation with the memory is lower than that of the i845D which falls behind its brothers with the accelerated Pentium4 by 10-20%. 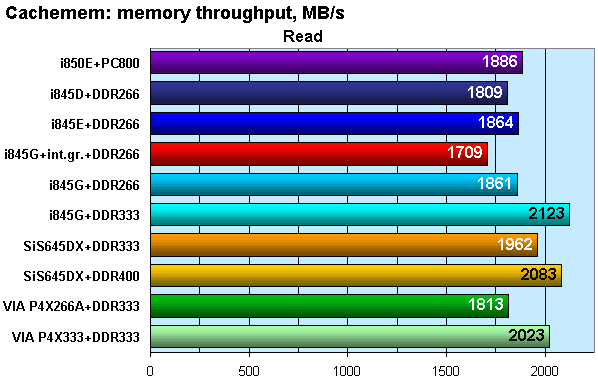 The i845E and i845G have proven their identity; the i845G coupled with the DDR333 takes a lead in the read speed. 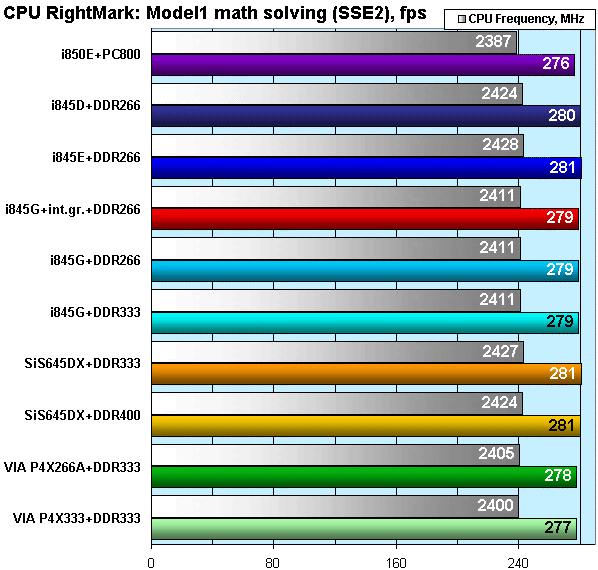 The competitors perform better in the write speed, and the SiS645DX+DDR400 and VIA P4X333+DDR333 have the best scores among the DDR chipsets (i850E goes separately thanks to the good advantage) as far as the overall speed of the low-level operation with memory is concerned. 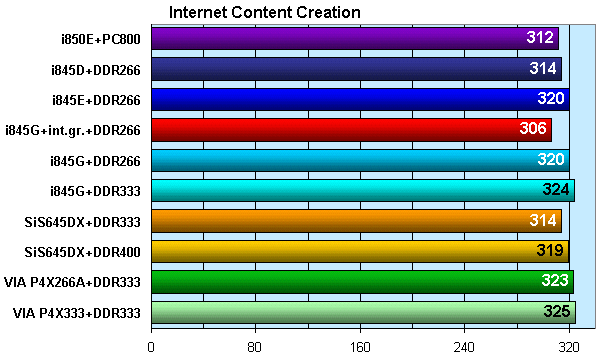 Here all the platforms perform very close to each other, and the results do not look dependent on the memory. The SiS chipset performs so weakly because of its IDE controller: as it is doubtless that the P4X333 outpaces the P4X266A in all parameters, the only explanation for the poor scores of the former is its undebugged redesigned V-Link interface or just unsuccessful beta version of the IDE drivers (we carried out the tests in full correspondence with the VIA's recommendations concerning drivers). 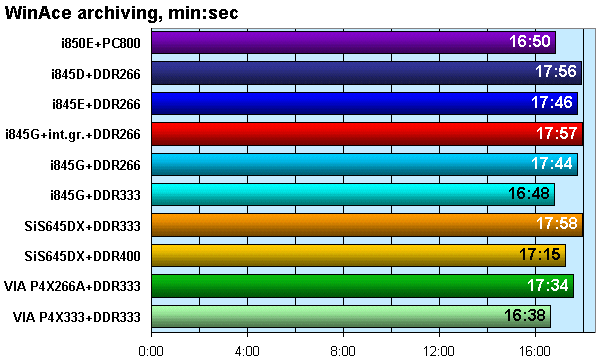 The acceleration of the processor bus helps a little in the MPEG4 encoding and it is almost useless in the WinAce archiving, where the memory speed is more important. 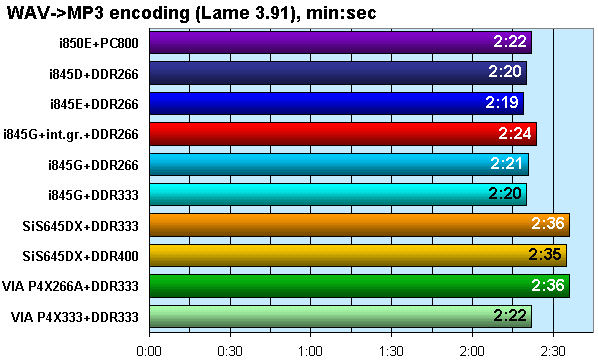 The video encoding works slower by 5% at the expense of its operation with graphics on the i845G with the integrated accelerator, the WinAce shell doesn't require this. 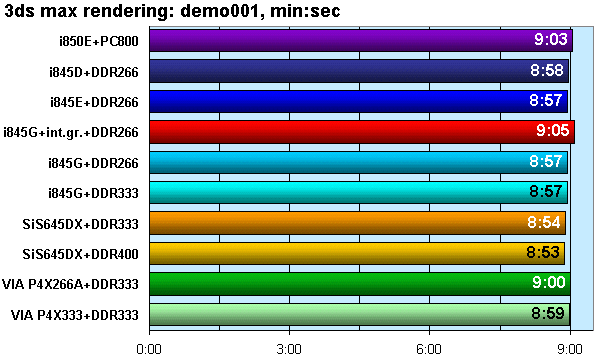 In general, both tasks show a benefit of the accelerated memory subsystem, and while the stream encoding of the MPEG4 is still faster on the i850E, the archiving with the large library makes the VIA P4X333 and i845G leaders. Both SYSmark suites show that there are no pure leaders or outsiders. The i845G with its integrated graphics falls behind a bit, but 3-5% gap won't be noticeable in real applications. The VIA P4X333 and i845G are the best again. 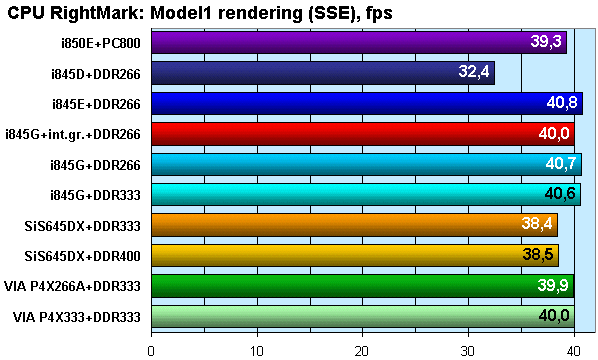 In the 3ds max rendering all boards go on a par again, with the i845G lagging a tad behind. This is not bad for an almost free video card! 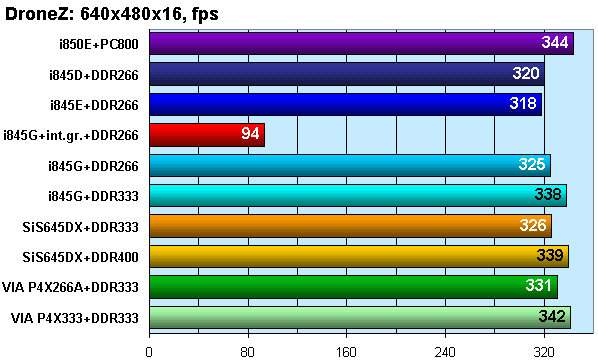 We chose only one test from the suite of professional SPECviewperf tests, which correctly reflects a layout in performance for the whole packet (taking into account that the AWadvs-04 and ProCDRS tests do not show the difference between systems equipped with the same powerful video accelerator). 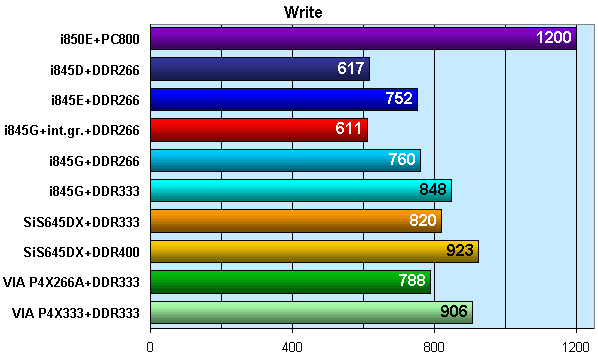 Well, both new i845 are on the same level, and this is probably the fastest set for the DDR266 - the SiS 645DX and P4X266A have a similar performance level, but both are coupled with the DDR333; the P4X333 and i845(E,G) with the DDR333 outscore even the SiS645DX+DDR400 and yield only to the i850E. In the games the situation is similar - no strong leaders or losers, except the i845G with its integrated graphics. First of all, a brief conclusion on the new Intel's processors: the results of the investigation carried out last time are proven today, in the tests of the i845D-i845E (or G). The boost provided by the faster bus is stable, but it will never be too high in the real tests: 5% (10% at best) - this is what we can get from the Pentium 4 on the 533 MHz bus as compared with the Pentium 4 on the 400 MHz one. As I mentioned already, if prices for old and new models are very close or coincide it makes sense to buy only new ones - I mean if you are looking for a new system or at least platform - otherwise you will have to replace your board (and memory). It's difficult to choose a chipset for the new Pentium 4, but the process is pleasant. Each of three chipset makers offers a very attractive solution. Intel comes with its i845E(G) - in all tests the results of both chipsets (on the boards from different companies with the presale BIOS versions) are very close, and the i845G is going to be dearer than the i845E just by a couple of dollars, that is why we can consider the i845G version with an external video card identical to the i845E. Taking into account that integrated chipsets are far not for all users, we should make a note that in any tasks which do not require efficient operation with 3D graphics the integrated video adapter of the i845G performs excellently, it hardly slows down the system. Intel offers one more interesting solution - i850E. 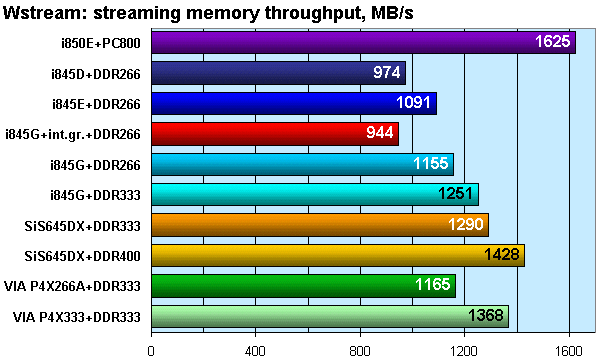 Performance of the systems using Rambus memory is still incomparable, especially if you have working PC1066. 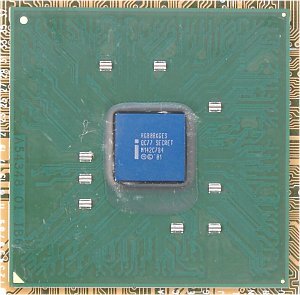 But still, other aging parameters of the chipset, an uncertain future of the RDRAM and other factors do not let me recommend this chipset to all. You should take it if you know the market situation quite well. SiS plays in a different market sector the principle of which is "it must work but be cheap". Well, the company does follow this slogan. Although it comes with the exotic DDR400, the chipset is still able to outscore many. 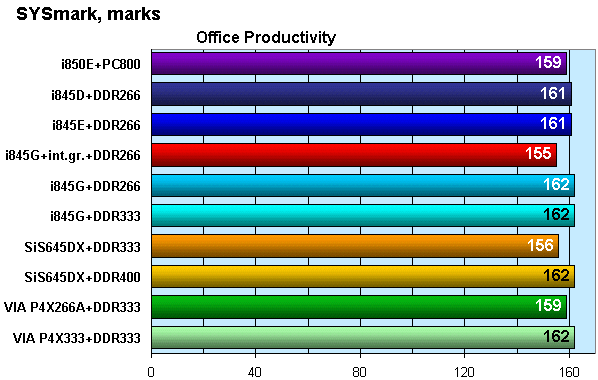 If you don't need too high performance, get a usual DDR266, and the SiS 645DX will make use of it. If you are short of money, the SiS 645DX is your choice. So, we have got the new processors, as well as the new chipsets for them. So, you can go and get one, and we will dive into the final part of our investigation where the video system of the i845G will be studied thoroughly.